We’re on the lookout for a new LEGO builder to join our team! Do you have a passion for all things LEGO? Do you have a solid knowledge of LEGO parts and pride yourself on attention to detail? 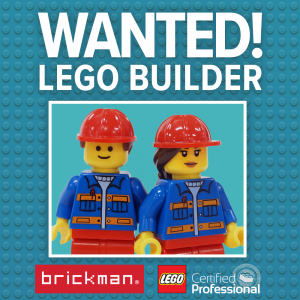 The Brickman, based in Tullamarine, is currently on the search for a new and enthusiastic model builder to join our dedicated and friendly build team on extremely cool, exciting and varied projects that could see you and your creations travelling around the globe. Work experience, skills, salary expectations and why you are right for this job. -1-2 pages showing off your original LEGO creations with photos and descriptions of each.